· MKTG provides insight and key learnings from a Toronto Gymshark pop-up, a UK-based fitness apparel company who executed three brand-relevant in-queue engagement tactics. · To avoid consumer disappointment, brands should: be transparent with consumers and inform them about queue lines ahead of time, implement surprise and delight tactics and leverage live social platforms so that consumers can tune in while waiting. · MKTG’s LIVE team also provides a variety of recommendations on how to keep consumers engaged while in queue. 1. Decide that the queue is too long and leave. 2. Enter the queue, become bored and impatient, then leave. 3. Wait the full time in the line and then ultimately be disappointed/soured on the brand activation. Research shows that on average, people overestimate how long they’ve waited in a line by about 36 percent (New York Times); compounding the effect and compelling them to leave, or at least become increasingly disengaged from the activation experience. To ensure that brands make the most of their investment in these activations, it’s important for brands to consider upfront what tactics can keep consumers entertained which will soften or prevent negative queue perceptions and experiences. MKTG provides insight from a recent case study and recommendations from our LIVE team on how a brand can keep their consumers occupied and brand top of mind while in queue. 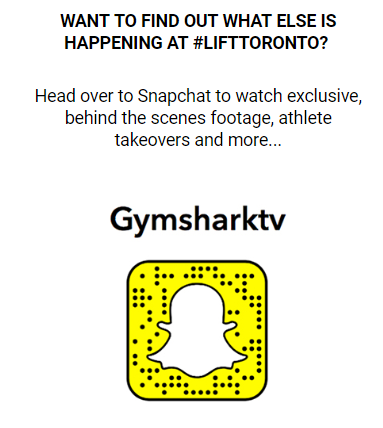 In October 2018, UK-based fitness apparel and accessories brand Gymshark launched their first pop up in Canada titled #LiftToronto. The brand has over 7 million followers with many being located in Toronto which attributed to the large turnout. The brand used the pop up opportunity to create a retail space which involved revamping a large warehouse facility on Dupont Street. This provided the opportunity for Gymshark fans to shop the latest collection, and engage with international Gymshark brand ambassadors and athletes (who are also social media celebrities) through short circuit workouts, meet-n-greets, photo and autograph opportunities. An hour before the pop up opened, 1000 people were already in queue (according to the Gymshark website). The wait time was over 4 hours by the time the activation opened. Despite the long line, the brand implemented tactics that kept consumers informed, leveled-up engagement and kept the energy high. 1. GYMSHARK WAS UPFRONT ABOUT QUEUE TIMES AND PROMISED SURPRISES. This allowed consumers to anticipate the wait so they were not disappointed on arrival. It also left consumers with the anticipation of in-line entertainment which would ease the insecurity of being in a long queue. Gymshark had a large athlete roster on-site which allowed them to execute meet-n-greet tactics not only inside the activation, but to those who were wrapped around the block. ­Demi Bagby aka “the world’s strongest teen” is known for her skilled acrobatic ability and was one of the many athletes used to interact and perform for consumers. This was not mentioned as part of the original programming and was an added-value surprise for consumers in line. The brand continued to execute similar tactics with other famous athletes such as playing a variety of games with fans and driving around in G­­­ymshark buses playing upbeat music. 3. GYMSHARK KEPT CONSUMERS IN THE LOOP BY LEVERAGING LIVE SOCIAL PLATFORMS; IGTV AND SNAPCHAT. Consumers who are waiting hours in line for a popular activation begin to experience FOMO (fear of missing out). They want to know what’s happening inside and what they are potentially missing. Gymshark’s solution was to leverage IGTV and Snapchat so that consumers could easily keep tabs on what action was taking place while waiting in line. Consumers who tuned in were gifted with live behind the scenes footage and athlete takeovers. The brand also used these channels to communicate key messaging and tease inside activation content, which kept the energy and hype alive. Be transparent with your consumer and inform them about queue lines ahead of time. Surprise and delight tactics are still effective, especially when it’s an experience relevant to fans. Promote and leverage live social platforms so consumers can tune in and stay engaged. While Gymshark found an effective way to engage those in queue, they may not fit every activation. Brands should get creative and uncover tactics that fit with their strategy and their unique situation. Have brand ambassadors yell out trivia questions and reward winners with minor prizes. Execute random giveaways in the line such as branded merchandise. Gamify it – encourage people download an app and play a game as a group. Comedians or other buskers entertaining the line. Provide consumers with portable chargers. Install brand related signage that double as selfie moments throughout the queue line. Digital signage with cartoons, comedy or information/news. Send food and beverage vendors through the lineup, or depending on time of year, build into your budget to provide water and portable fans if hot, or hand warmers and hot beverages if cold. HAVE ANY OTHER IDEAS IN MIND? Stayed tuned for an upcoming blog post on how to avoid and/or decrease queue lines at your next activation.